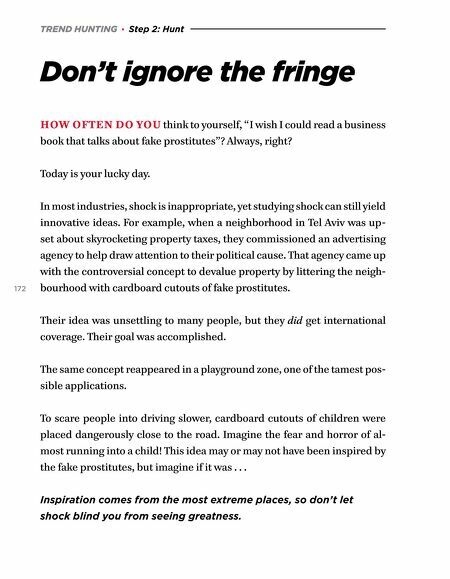 TREND HUNTING · Step 2: Hunt Don't ignore the fringe HOW OFTEN DO YOU think to yourself, "I wish I could read a business book that talks about fake prostitutes"? Always, right? Today is your lucky day. 172 In most industries, shock is inappropriate, yet studying shock can still yield innovative ideas. For example, when a neighborhood in Tel Aviv was up- set about skyrocketing property taxes, they commissioned an advertising agency to help draw attention to their political cause. That agency came up with the controversial concept to devalue property by littering the neigh- bourhood with cardboard cutouts of fake prostitutes. Their idea was unsettling to many people, but they did get international coverage. Their goal was accomplished. The same concept reappeared in a playground zone, one of the tamest pos- sible applications. To scare people into driving slower, cardboard cutouts of children were placed dangerously close to the road. Imagine the fear and horror of al- most running into a child! This idea may or may not have been inspired by the fake prostitutes, but imagine if it was . . . Inspiration comes from the most extreme places, so don't let shock blind you from seeing greatness.